St. Bernard Condominiums - your winter mountain home! Located just a short walk to the base area and the Hotel St. Bernard, we offer your perfect retreat! Unit #1D of the St. Bernard Condominiums offers space, light and a panoramic view of Taos Ski Valley. The master bedroom (with attached bath) features a king size bed and flat screen television. The second bedroom has a queen bed and a twin day bed. The bathroom is located across the hallway and serves both the second bedroom and the living area. Each of our condos feature their own washer/dryer unit and satellite television. The kitchen is fully equipped with stainless steel appliances and all the amenities you will need to start off your day. Step down into the dining area and living room with wood burning fireplace. Each condo has a supply of firewood right at your front door! 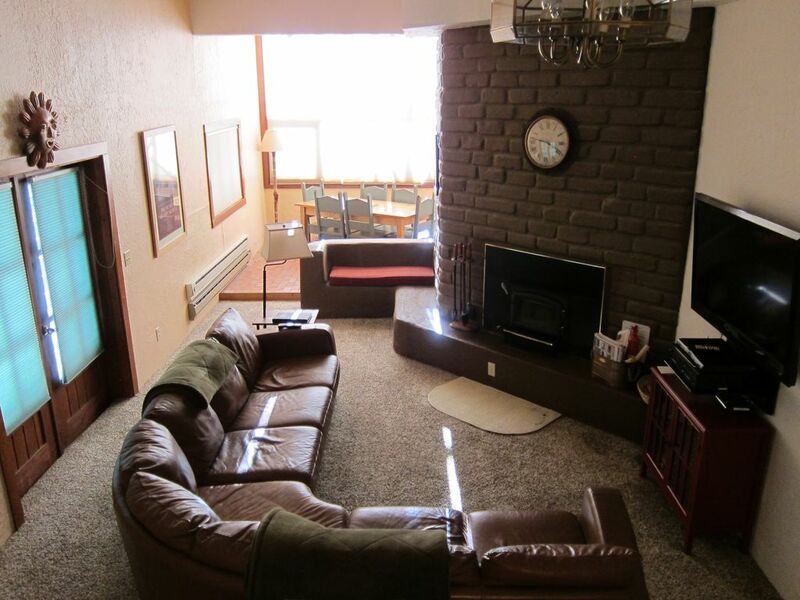 This condo also has a large, sunny patio with a spectacular view of the ski valley. As a guest of the St. Bernard Condominiums, you have use of the facilities at the Hotel St. Bernard. After a hard day of skiing, relax in our teakwood hot tub or enjoy a massage either at the hotel or in the privacy of your condo. Also located at the hotel, our condo guests have their own ski equipment storage room....right at the base of the lift! Lunch is available either inside with sandwiches, soups and a daily special or outside on our Burger Deck where we serve burgers, grilled chicken and other featured grilled items as you bask in the warmth of the famous Taos sunshine! Most of our guests are part of our weekly dinner plan and should arrive each evening (starting on Saturday evening) at the Hotel by 6:15 p.m. as dinner is served promptly at 6:30 p.m. Prepare to enjoy our world-famous gourmet dinners served by your host, Jean Mayer, as you visit with friends - both new and old - at our family-style dining tables. When you select our weekly package, it includes 7 nights (Saturday to Saturday) lodging in our 2 bedroom/2 bath mountain homes, a 6-day lift & lesson Ski-Better-Week package for all level skiers and 7 nightly dinners at the Hotel St. Bernard. Nightly stays with a 3 night minimum are available when space is available. Experience a truly unique vacation here in Taos Ski Valley at the St. Bernard Condominiums! Families and children are a huge part of the St. Bernard experience and we welcome them! One of the most popular aspects of our family program is our nightly Kids Club at the hotel. The kids meet at the hotel dining room at 5:30 p.m. to have a kid-friendly dinner before participating in a planned nightly event such as marshmallow roast, movie night or sledding. The children's program is supervised by Janet Shipley and her capable staff. Taos Ski Valley offers a full day ski school for children ages 3 years (potty trained) to 12 years (ages 13-15 can also participate) and childcare for ages 3 months up to age 3. Snowboard lessons are also available for ages 4 & up. The Junior Ski program includes a morning & afternoon lesson, lunch with their class and equipment rental. We encourage everyone to participate in the weekly package and look forward to helping you plan your dream ski vacation! Come ski/snowboard with us! After booking your lodging at the St. Bernard Condominiums through this site, you can add on our weekly ski package or dinner package directly with us! I love staying here. Very comfortable condo, cozy beds with well equipped kitchen - I quite easily cooked my Thanksgiving dinner here and entertained many on this day. We love coming for opening day...I cook and the family skis. I love the "green house" like windows to the slopes and to catch the evening stars...and amazing mountain jays would come to the terrace as we have our breakfast...Feels like home to me...We love Taos Ski Valley! This rate is based on 4 people per unit and changes if 5 or 6 people occupy unit. There is also a per person service fee. Ski package or dinner package at Hotel St. Bernard available.